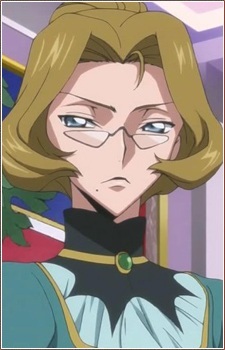 Alicia Lohmeyer is an aide and adviser assigned by Britannia to observe Nunnally upon her appointment as the new Viceroy of Area 11. The quintessential Britannian, she regards Nunnally's pro-Eleven political stance with frigid opposition, but dutifully obeys regardless. When Zero engineers the exile of one million Japanese during a second attempt at forming the Special Administrative Zone of Japan, she nearly starts a second massacre by firing upon the crowd. Suzaku disarms her to prevent it from happening again. She becomes more resentful as Nunnally begins to assert herself in the workings of the government, and even orders Kallen's execution (which is derailed by Sayoko) while Nunnally is being evacuated from the second battle of Tokyo. But Alicia dies when the decoy ship she entered is consumed in the blast from the F.L.E.I.J.A. bomb, killing her and the other occupants. Her name and character design are direct references to Miss Rottenmeier, a character from Nippon Animation's popular anime series Heidi, Girl of the Alps.